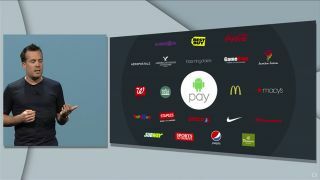 Android Pay announced at Google I/O. Android Pay has been on the verge of launching for a good couple of weeks now, but each rumoured date comes and goes without the arrival of Google's latest push into the mobile payments market. Now Google's own apps are teasing the arrival of Android Pay - specifically Google Wallet, which shows an advert for the new service and explains how the new app is going to take over from the old one. There's also a Frequently Asked Questions document on the web that you can refer to for all your Android Pay-related questions. The new Google Wallet app, once it arrives, will let you send and receive money from users on any platform; Android Pay, meanwhile, is a mobile payments system built into Android itself. A leaked memo from inside McDonald's had previously suggested Android Pay would be launching 26 August, which was obviously not the case. If your confidence in the veracity of internal memos hasn't been completely shot to pieces, there's now a new leak from US carrier Verizon. That points to 16 September as the launch date, one week after Apple shows off its iPhones and two weeks before we're expecting the new Nexus handsets to break cover. Google will definitely want Android Pay in place by then. The arrival of new Nexus hardware should also mark the start of the great Android Marshmallow roll-out, so it's going to be a busy couple of months for Google. Enjoy your last few days in an Android Pay-free world.